MIAMI (AP) The last Miami play was designed by Heat coach Erik Spoelstra to put the ball in Josh Richardson’s hands, and with it came the right to decide who would take his team’s biggest shot of the game. ”He drew it up for me and I was kind of surprised,” Richardson said. So surprised, in fact, that Richardson emerged from that huddle telling Wayne Ellington and Tyler Johnson to get ready for his pass. But a lane opened to the rim, Richardson laid the ball home and the Heat won their fourth straight – all by single digits, Miami’s longest stretch of such wins since November 2012. ”I should have made the right read instead of shooting it,” Mitchell said. Mitchell was 3 for 12 in the opening half, after going 5 for 14 against the Heat when the teams met in November. It was like he was due to break out – and did just that, needing only 3 minutes to score Utah’s first 11 points of the second half. ”Find a way at the end,” Spoelstra said. Jazz: The 3:30 p.m. EST tip is the earliest for Utah this season. … The Jazz scored 74 points in the teams’ first meeting this season; Joe Johnson’s jumper with 1:09 left in the third gave Utah 75 on Sunday. … Utah is off until Wednesday, which means the Jazz – who had time for exactly one non-gameday practice in December – will get one during this trip. Heat: Miami plays seven of its next eight, and 11 of its next 14, on the road. … There’s been no change yet in the status of Dion Waiters, who sought a second opinion on his sprained left ankle last week. 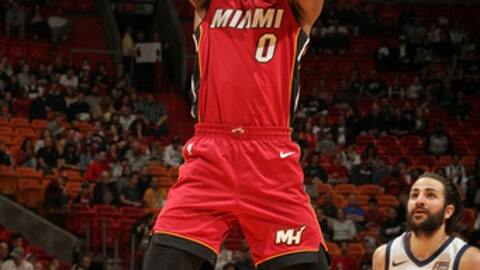 Waiters missed his sixth consecutive game. … The Heat sent Derrick Walton Jr. to Sioux Falls of the G League over the weekend, after he appeared in 12 games with Miami. Whiteside had tip-ins on consecutive possessions in the first quarter, 22 seconds apart, which sounds great – until realizing it happened on both ends of the floor. Favors was credited with the basket when Whiteside accidentally deflected the ball in for two Utah points, and on the ensuing Miami possession the Heat center tipped in a miss by Dragic.